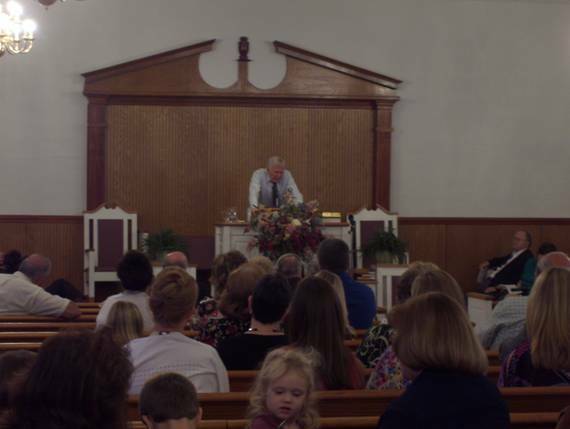 This past weekend (September 28-30), Cool Springs Primitive Baptist Church hosted a special 5th Sunday meeting with Elder Sonny Pyles from Graham, TX as the invited minister. Many years ago, Elder Pyles was a regular visitor to this area and preached the annual meeting at Cool Springs for many consecutive years. However, it had been a fair amount of time since Brother Sonny had been to the area in general and Cool Springs in particular. Therefore, both he and the church looked forward to the time and enjoyed one another’s presence during the course of the weekend. Brother Sonny is one of those ministers that I have known all my life, and you might say that I “grew up with him” though I never really lived around him. He was very close to my parents before they had children, and then as time went on, with the whole family. Hearkening back to my own past, I can remember many days in the home with Mom ironing clothes and doing other household chores while a preaching tape of Brother Sonny played in the background. She had extensive tapes from his days of preaching in many places (West Texas primarily) back in the 1970s. He stayed in our home many times, and it was always fun to watch him and Dad interact as they both had personalities that suited each other with dry senses of humor that complemented well. Having him in our home this weekend brought back some old memories, and he and I swapped many stories from those by-gone days. While Brother Sonny has aged considerably since I knew him in my youth, he still has the fire to keep going. We are thankful to our God above for blessing us with yet another opportunity to worship together for an extended period in His house. The visitation from our sister churches and the area in general was considerable, and we thank all of our visitors that came to be with us. Truly, the presence of the Lord’s saints cheers the soul, and we thank our kindred in Christ for their kindness. May it encourage us to visit our brethren regularly and show ourselves friendly. 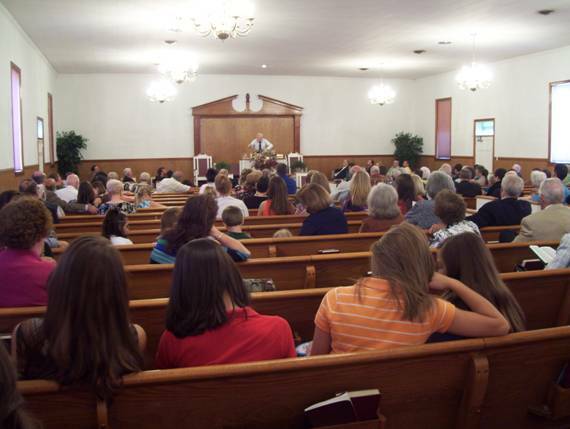 Below, I have posted the order of services as well as a couple of photos of Brother Sonny preaching on Sunday morning. Elder Sonny Pyles – “Lions” from Isaiah 29:1. Elder Pyles contrasted the difference between our Lion of the tribe of Judah (Christ Jesus) with the ultimate imitator (Satan) who walks about as a roaring lion. Elder Sonny Pyles – “Martha, Lazarus, and Mary” from John 11. Elder Pyles showed the spiritual understanding and experiences of the Lord Jesus with this family that meant so much to Him. Though most of the emphasis of spirituality in the family is placed on Mary, he showed that it was a spiritual family in general. Elder Sonny Pyles – “Genesis 11 and the confounding of the languages.” Elder Pyles gave an in-depth synopsis of how language differences originated and how those languages developed into what we know today. Through language alone, one can see that different cultures give evidence to the truth of God’s testimony through their own culture. Elder Sonny Pyles – “Assurance from I John 3:19 .” Elder Pyles made the Biblical case that assurance comes and goes depending on one’s circumstances, but that the reality of Christ’s work (that our assurance trusts in) never changes. From the sermon, no one could deny the Biblical fact that how we feel or behave never changes our position in Christ but it can change our assurance of that position.